Tanya Aguiñiga grew up in both San Diego, CA and Tijuana, Mexico, a bi-cultural artist whose quest is to create a dialogue between two very different cultural experiences in her craft-based artistic expression. Lia Cook with her Doll Series weavings. Mark Markley photograph. Lia Cook (b. 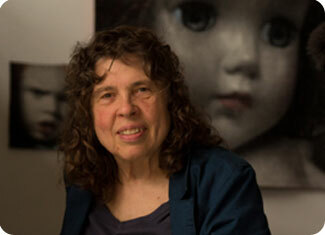 1942) is a fiber artist who combines weaving, painting, photography and digital technology to create her work. 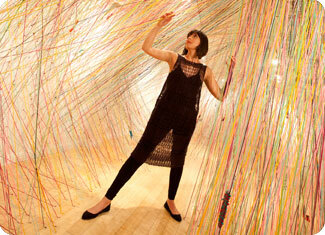 Cook’s work attempts to shatter restrictive theories about craft, art, science and technology. Her focus is on the history and meaning of textiles in all cultures and its impact on our humanity. Her latest project is about the brain – Lia takes notions of imaging, memory and emotion, measures the physical human response, and incorporates all this information into her weavings. Clary Illian adds a handle to her pitcher. Mark Markley photograph. 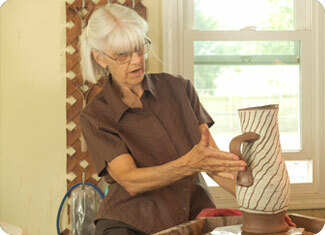 Clary Illian is a potter who lives in Ely, Iowa. Illian apprenticed at Leach Pottery from 1964-65. Hewing to the Leach philosophy, her subsequent work concentrated on the purity of the pot’s form and the potter’s life – one lived with strong convictions and a pure heart. She continues to produce useful daily pottery for local customers at a reasonable price. Warren MacKenzie throws a bowl. Mark Markley photograph. Warren MacKenzie (b. 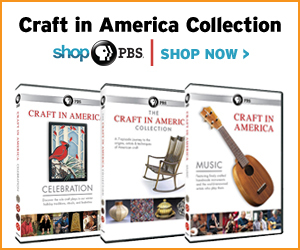 1924) is one of America’s greatest living potters and an inspiration to younger generations. Having apprenticed at the Leach Pottery in 1952, MacKenzie brought the Mingei aesthetic to the St. Croix Valley where it took root and spread. 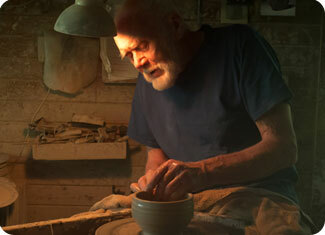 An inspired teacher, MacKenzie embodied the philosophy, impressing young potters with a dedication to the ideals of simplicity, serviceability and rough beauty. 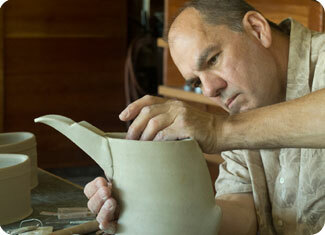 Jeff Oestreich builds his beaked pitcher. Mark Markley photograph. Jeff Oestreich (b. 1947) was trained in the austere simplicity of traditional Asian pottery while serving as apprentice to Bernard Leach in England in the 1960s. Driven to achieve a personal style, he overlaid this foundation with a passion for Art Deco design and a ceaseless exploration of glaze and decoration techniques. His signature “beaked pitcher” is the refinement of a personal challenge to combine form and function elegantly.